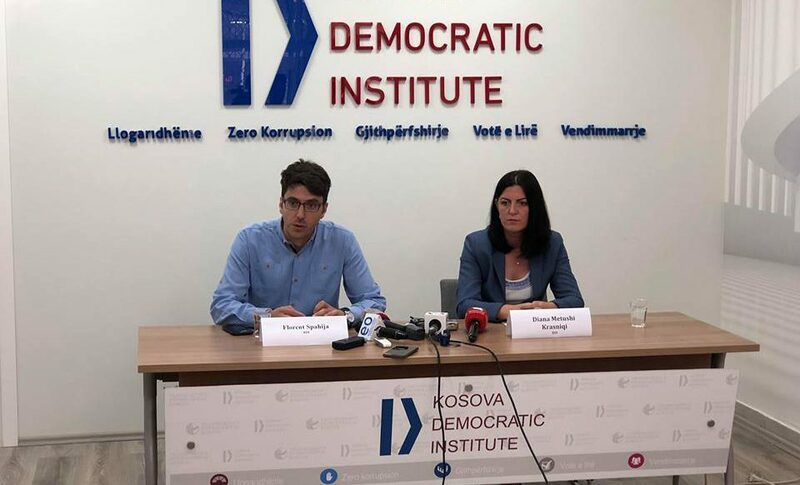 The Kosovo Democratic Institute (KDI) / Transparency International Kosovo (TIK) held today a press conference during which were presented the concrete proposals of the KDI for the institutions regarding the steps to be taken in the fight against corruption. On this occasion Diana Metushi-Krasniqi from KDI / ICT has emphasized that regarding the issue of corruption and fighting this phenomenon, the state of Kosovo is showing some kind of disinterest towards this issue and taking concrete steps in this regard. “We are all witness of corruption and the lack of concrete state actions in the fight against corruption. For years people have heard nothing more than ‘corruption will be fought’ or ‘we are fighting corruption’ and ‘we have taken all actions in the fight against corruption’. However, when one looks at what has been done to fight corruption, it sees our country somewhat disinterested in this important issue, “she added, pointing out that this issue remains a criteria for visa liberalization. The completion as soon as possible of major cases such as Stenta Case, Case of former Mayor of Lipjan Shukri Buja, Case of former major of Skenderaj Sami Lushtaku, Arben Gjuka director of KEK and former chairman of PRB Hysni Hoxha etc., Land Case (Azem Syla etc). The Basic Court in Pristina as the largest in the country has most of the targeted cases including these cases. The Kosovo Progress Report for the past year has decided as an obligation that these cases should be judged and completed in order to mark progress in the fight against corruption. Completing these cases is also a criteria for visa liberalization. Courts should give priority to these cases and, as soon as possible, end the trials. The KJC should be ready to assist the courts and replenish any claims they have in cases of corruption and organized crime. The completion of these cases is also respecting the rights of the accused in these cases, fair trial and in reasonable time. The KJC in cooperation with the courts should enable the public, media and civil society access to these trials for their monitoring and follow-up. Immediate actions by the State Prosecutor’s Office, in initiating investigations or completing investigations in cases where corruption is suspected as highway construction, selling of KEK, payment of 60m euros penalties for Bectel & Enka, failure to privatize Post and Kosovo Telecom, privatization of public enterprises by the Privatization Agency of Kosovo, etc. Prosecution and the trial of powerful people suspected of corruption and organized crime should be a priority of the State Prosecutor. The completion of investigations and the gathering of evidence in a professional manner and the delivery to the court of these cases would have a positive impact and increase the confidence of citizens in the fight against corruption and cases reported by citizens for corruption and organized crime would increase. The State Prosecution should make sure to sequester the wealth of people suspected of corruption, and the Court, after announcing the verdicts if it founds them guilty, then confiscate as many property gained through criminal offense. Confiscation of property is mentioned as Kosovo’s continued failure in the Progress Report. Decriminalization of police and accountability of all police officers involved in corruption and organized crime, with increased transparency of cases that have been made public in the media. Obligation of political parties to submit professional reports with accurate information about their funding and spending during election campaigns as well as strict controls on the declarations submitted by them. Obligation of central and local public enterprises to be transparent and accountable to the public. Depoliticizing of all these boards of public enterprises. Closure or merger of some independent agencies that have no functions other than the spending of public money and the possibility of corruption. The Kosovo Assembly should ensure that the institution of the Procurement Review Body (PRB) and the Public Procurement Regulatory Commission (PPRC) are depoliticised, according to recommendations from the Progress Report on Kosovo. The Assembly of Kosovo has an obligation to elect as soon as possible members of the PRB, as for a long time the PRB operates with three members of the five that should have. The lack of election of the members of the PRB has directly affected the normal functioning of this Tendering Court, as all decisions are now taken by only these three members. Kosovo Assembly, in accordance with legal procedures, should choose independent and not political professionals for these two positions. State institutions should start the vetting process for all procurement officers in all contracting authorities that spend public money. Findings form the vetting to be evidence to the State Prosecutor to initiate criminal proceedings against persons that do not pass the vetting. The National Audit Office should be obliged to ‘ex-officio’ submit to the State Prosecutor all cases of violations which are found by auditors during the audit of state institutions. The Government and the Assembly of Kosovo in this case should act swiftly on the proposal respectively adopting new rules that would oblige the NAO in the issue of filing criminal reports for persons who have committed violations while performing their duties. The Criminal Code of Kosovo should foresee as a criminal offense the loss of money and public property for the purpose of private profit of public officials. Procurement Review Body should be obliged that all violations they find during the examination and placement of different tenders by the contracting authorities or parties in the procedure, that automatically with criminal charges together with the evidence present the case to the State Prosecutor’s Office. Opening of all contracts and payments realized with public money. Permission to strictly control tender procedures by changing the bid evaluation approach. Facilitating access to information for journalists / civil society and interested citizens. And lastly, we call on the Anti-Corruption Agency not to make proposals for partial closure of wealth declaration for senior officials, but to deal with strengthening the mechanisms for verifying the declared property and issuing material evidence to the state prosecution.